Well, I’m not one of those people who have a cute little portable wheel, and what I do have doesn’t really fit on the back of my motorcycle, so thinking I’ll pass on this one, but how much fun could this be?? You could take a drop spindle, sit in the balcony at the opera and bean someone in the head below you. Or on the top steps of the bleachers at a football or hockey game and spin an awful lot of yarn by the time the spindle got to the ground… just sayin…. So, who’s in? Click over to here for more info! How awesome. This is a wonderful idea …. 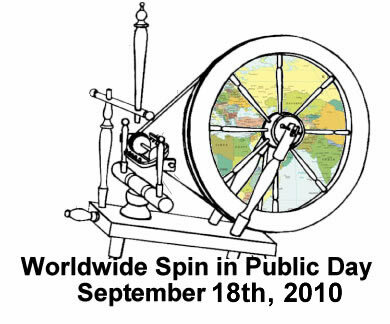 I would be there with my spinning wheel if I could but unfortunately Australia is a bit far to come from …. lol. Would love to see the photos though.